Every once in a while we receive the question whether we could live with just one watch, and which watch that would be. You have probably also fantasized yourself of trading (all) the watch in your collection for just one watch. In this article, we take a look at watches that we find interesting in a certain price bandwidth. From an entry-level mechanical Seiko to something ‘haute horlogerie’. Of course, our picks might change over time (or by the week) as new models are being introduced all the time (as in well over a week during BaselWorld 2017). However, if we were going to pick only one watch, chances are quite big that we’d select an iconic model. That said, only having one watch… That is quite a difficult ‘task’. You need at least a chronograph, a watch with an extra time zone, a diver’s watch (of course, even if the only water you’ll see is either at the sink , shower, rain or in the fridge) and a watch with a battery to make sure everything else is running on time. On the other hand, I envy that group of people with only one watch as well. Makes life easier and – in fact – aren’t we watch aficionados jealous of the +60 year old guys who have owned their Rolex Submariner (or whatever) since their 20th birthday. Reality is however that the majority of people – including me – need to make choices. So, what if you want to buy one good watch. For now. Where should you start? To help you out a bit, I will give 10 possible choices in 10 different price categories. From relatively cheap (below 500 Euro) to a watch with a price tag of over € 30.000,- Euro and 8 other price categories in between. For this overview of 10 watches in 10 different price categories, I will stick to new watches only as the majority of people probably won’t go vintage for their one and only watch. It would make a nice sequel to this article though, to come up with a list of 10 vintage watches in the same price ranges. Enough talking, the task is clear so let’s go. In this price category you will find lots of watches. However, if you rule out quartz watches (and thus a lot of fashion related watches) the list becomes quite narrow. I had a hard time deciding between a Tissot Visodate (we reviewed it here) and a Seiko diver (SKX007). The Seiko SKX007 (we reviewed it here) is basically the successor of the 7002, 6309 and 6105 models that have a high number of fans all over the world. Even the SKX007 can be considered a classic today. This 41mm diver’s watch will suit most men and it can be bought with a black rubber strap as well as with a jubilee-style bracelet. A variety of other straps and bracelets is available as well for this model. Inside is a Seiko caliber 7S26 automatic movement and has a day and date indicator. I actually bought this model myself a couple of weeks ago, to have a perfect beater. Although list price is €299 Euro here, actual market prices make it an even more interesting watch. Last November we performed an in-depth review of this Longines HydroConquest with a suggested retail price of €940 Euro. An amazing watch for just below €1000 Euro. Another great contester was this Sinn 104 that the watch manufacturer from Frankfurt am Main, which is also priced just below € 1000 Euro. The Longines HydroConquest has an ETA caliber 2824 movement inside and comes with a solid stainless steel bracelet but can also be bought with a rubber strap. It is a typical diver’s watch with a screw-down crown, uni-directional bezel and bracelet with diver’s extension but will also suit you well being a desk diver. It already starts to become a bit more difficult in this price range, as there is a lot to choose from, especially from some of the bigger (and perhaps this plays a role for many people out there) brand names on the dial. In this price range, a highly sought after watch is the TAG Heuer Aquaracer 500M, which is definitely a great buy at €1800 Euro (list price). However, a brand that is very familiar to me personally and by a lot of enthusiasts of the online watch community is the aforementioned Sinn from Frankfurt. Sinn has a 857 UTC TestAf LH Cargo watch for €1890 Euro. A great timepiece, limited to 777 pieces only and comes in a wonderful Lufthansa Cargo box. Inside is an ETA caliber ETA 2893-2 movement, indicating an extra time zone on a 24 hour scale. The photo below is from our friends of Tidssonen in Norway who did an in-depth review of the watch (here). This feels a bit awkward actually, as I don’t feel that old but I can still remember the days you bought a very decent new (!) Rolex Submariner for this money as if it were yesterday. Well, those days are gone and where the current Rolex Submariner has a € 7500 Euro price tag, Tudor comes in to fill that gap that Rolex left behind. With their relaunch just a few years ago, with Heritage models like the chronograph and this Black Bay, they offer a really interesting watch in this €3000 – €4000 price range, with in-house movement. The Tudor Heritage Black Bay Dark has been introduced in 2016. We did an in-depth review of this Heritage Black Bay watch here, after wearing it for a few weeks (this was the ETA version though). If you are more into classical looking watches, I’d suggest to have a look at some of the Longines Master Collection pieces, with moon phase and calendar functions. What did you expect? We dedicated an entire day after this icon. The roots of the Omega Speedmaster Professional (reference 311.30.42.30.01.005) go back to 1957 although the current model looks more like the version that was introduced in 1968. It is still the flight qualified watch for all manned NASA missions and currently lists for €4400 Euro. This icon comes with a large presentation box with extra straps, a loupe, a commemorative coin and a tool to swap straps yourself. Inside is the Lemania based Omega caliber 1861 movement. If you don’t like a non-water resistant watch, plexi crystal or a hand-wound watch, you might check-out the Omega Seamaster 300 that was introduced in 2014. Find it here. Introduced in Basel in 2013 and in my opinion one of the nicest GMT-Master II variations around. This GMT-Master II 116710BLNR or ‘Batman’ is a great all-round watch with an extra time zone. We did a write-up on the history of the GMT-Master a while ago (click here), which you might find interesting to read when investigating a possible purchase of this model. Inside is Rolex in-house movement caliber 3186, also used in its predecessor. The Oyster bracelet is not to everyone’s liking due to the polished center link, but it is one of the most comfortable bracelet’s you will ever wear. 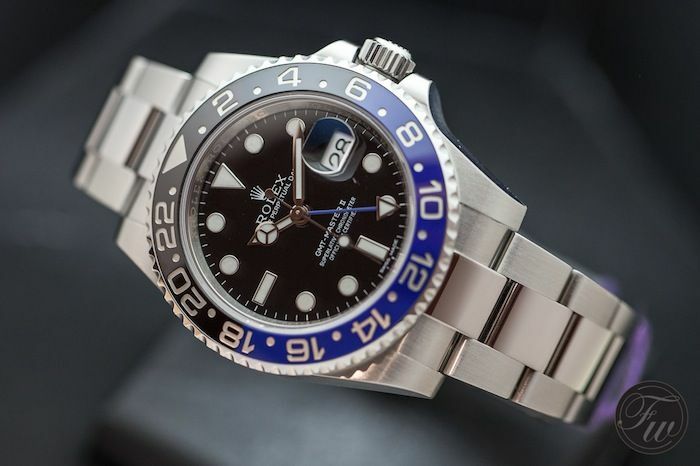 Alternatives might be the Rolex Explorer II, Rolex Submariner or a Rolex Datejust II. In this price range, it gets a bit tricky as it is the price range where IWC, Jaeger-LeCoultre, Rolex, Panerai and a lot of others reside. Yet I picked the Speedmaster Grey Side of the Moon. Since I am a big fan of the Moonwatch, the hand-wound versions to be precise, the design of the Grey Side and Dark Side of the Moon watches are appealing to me. If I would take that sentiment out of my reason for picking this watch, that would be still plenty of reasons left to buy this particular watch. The Omega caliber 9300 movement is simply stunning (we’ve been to the assembly facility, reported here), using the chronograph pushers feels like silk. The domed sapphire crystals on both sides and the dark ceramic case make this is very handsome watch, as does the lay-out of the watch. Usable for every day wear. Alternative? The Dark Side of the Moon. Another brand? Have you seen the JLC Geophysic? I could have said Audemars Piguet Royal Oak 15202 but truth of the matter is that I would probably go pre-owned or vintage on that model. Ressence is a brand found by Benoit Mintiens in 2009, a so called independent watchmaker. The dial has rotating discs that will indicate the time, as if they float on the dial. Something Benoit Mintiens really mastered with the Type 3 watch where the dial module has been oil-filled. A very interesting and uncommon watch but I’d say it would make a beautiful one-watch to own. Price tag on this watch is approx. €17.500,- Euro). Alternatives? Okay, the Audemars Piguet Royal Oak 15202ST. A very thin comfortable everyday watch. Or what about the Jaeger-LeCoultre Ultra-Thin Perpetual Calendar of just below 20.000 Euro? A safe choice perhaps, but it is the watch – together with the Audemars Piguet Royal Oak – that had huge impact in the market of luxury watches in the 1970s. 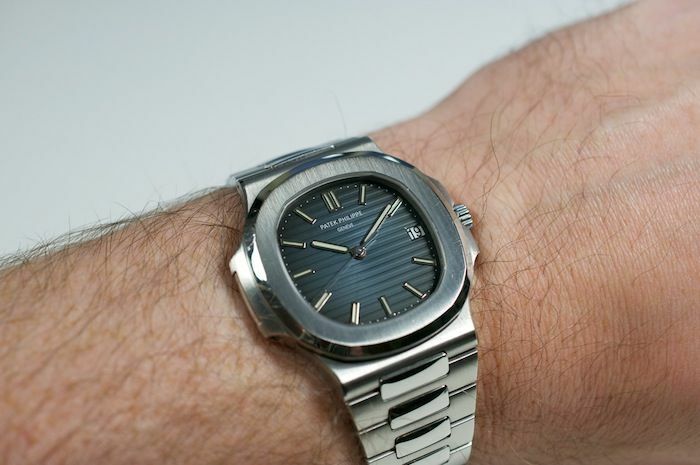 Although the current stainless steel Nautilus reference 5711/1A has a different case construction than the original model reference 3700/1A (read our 5711/1A versus 3700/1A comparison article here), it is still a very attractive watch to have with its sleek lines and port hole appearance. Inside is Patek Philippe’s caliber 324 S C movement, a beautiful finished and constructed movement. Alternative? The Ressence Type 3 or the A. Lange & Söhne Lange 1 or Patek Philippe Calatrava 5227 if you are more into classic watches. Although anything over €30.000 Euro would do in this category, I still feel I am being modest by selecting a watch of €51.900 Euro. However, this watch is not about the price tag. The A. Lange & Söhne Lange 1 Time Zone 116.025 in platinum is based on one of my favourite dress watches, the Lange 1. The watchmakers from Dresden combined this icon with the functionality of a world timer watch (I have a weak spot for those) and came up with this easy-to-use Lange 1 Time Zone. As you can see in the photo we took a while ago (below), you will see how detailed the dial is of this watch. And that’s only the front side of the watch. On the back side, you can admire its hand-wound caliber L031.1 movement with the 3/4 base plate made of German silver. This would be my watch of choice in this price category. Alternatives? Anything Patek from their Grand Complications collection or something out of this world from one of the independents? This price category opens up a lot of options and you can discuss whether someone with a watch in this price range stays with one watch. I doubt it. Does your list look different? Please share with us in the comments below. You don’t have to go through all price categories, but please do tell us what you would buy as your only one watch. *This article appeared first in January 2015 and has been revised.